I don't know about you, but there's a feature that ruined many of my Google search results pages. It's not that Google can't return relevant results, the problem is that Google tries to be clever and detects keywords that are associated with a site. If it finds one, Google will return a lot of results from that site. In fact, sometimes you'll have a hard time finding results from other domains. Ever since its launch, Google promoted diversity and used host crowding to show "up to two results from each hostname/subdomain of a domain name". Sometimes Google displayed a link that restricted the results to that domain or subdomain, but users had to click it. Matt Cutts wrote in 2007 that "we did hear complaints that for some types of searches (e.g. esoteric or long-tail searches), Google could return a search page with lots of results all from one domain. In the last few weeks we changed our algorithms to make that less likely to happen". Then Google introduced sitelinks and started to show more pages from a domain. Two years ago, a Google blog post announced that "for queries that indicate a strong user interest in a particular domain, like [exhibitions at amnh], we'll now show more results from the relevant site". Since that announcement, host crowding was a thing of the past and Google started to include more and more results from a single domain. I complained about this back in 2010 and mentioned that this feature could become annoying, but now it's much worse. Sometimes you can find queries that return mostly results from a domain. 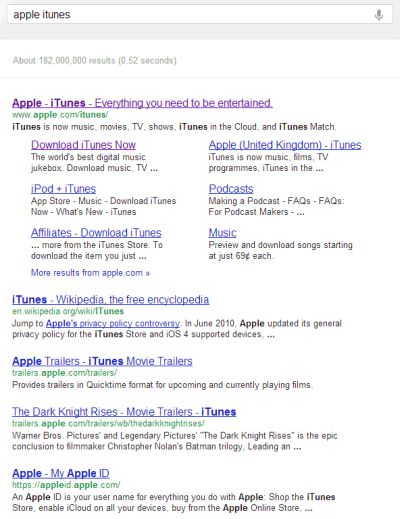 For example, when you search for [apple itunes] Google assumes that you want results from apple.com and starts to return a lot of irellevant pages. 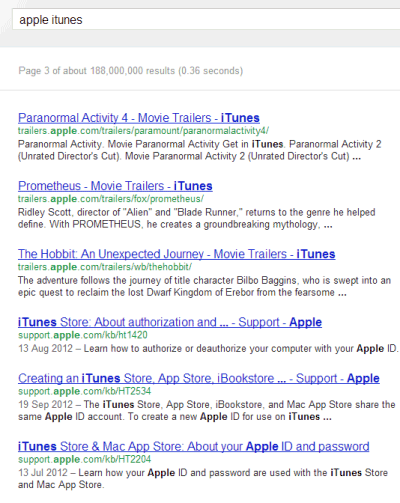 Sure, you can still find results from other domains, but 31 of the top 50 results are from apple.com. 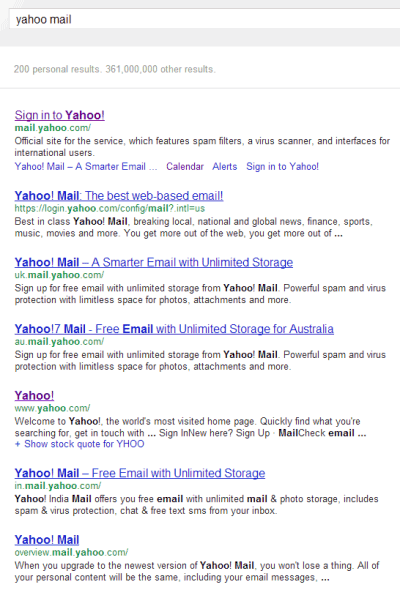 If you search for [yahoo mail], Google returns a lot of uninteresting results from Yahoo's international sites, instead of including news articles, blog posts, reviews, tutorials. Search for [berkeley college] and 26 of the top 50 results are from berkeley.edu. That's just too much. Having to constantly add to the query "-site:dominantresult.com" is annoying, not to mention that most Google users don't even know about search operators and shouldn't have to use them. And this annoyance is not limited to navigational queries. 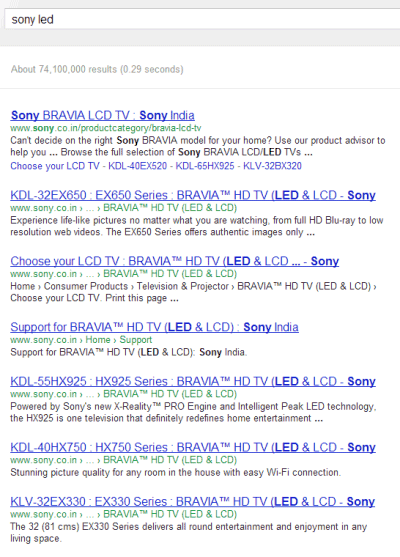 What if you're not in India, search for [sony led] and Google's top 7 results are from Sony India? That's what happened when I disabled Google Instant and set Google to show 50 results per page. Showing too many results from a domain is a bad idea because a search engine should offer information from multiple sources, while results should be relevant and comprehensive. Google's mission is to "organize the world's information and make it universally accessible and useful," but Google forgot to make the information accessible. I noticed that too, for instance, some of my search queries would return pages of results from some webtopicture.com (useless, spammy website). That's really annoying. Let's hope Google fixes that. For many years i have used google, now i use only duckduckgo.com and i am very happy. For example, this problem with duckduckgo doesn't exits. Duckduckgo is young but very efficient. He already mentioned the '-site:xyz.com' option for his 'berkeley college' example. Having to do that constantly is extremely annoying! I have never once considered this "feature" to ever be an asset!!! I don't know what @TomIsOutdoors uses Google for but for me it has never been anything but a hindrance. Listing multiple results from the same domain is extremely annoying and a hindrance. The old solution, was much better, to show a single result from the domain, and a link to "Show more results from this domain". Ah good! Not just me then. I've noticed this over time and it is very annoying when researching. I've also noticed this in google PL. Very annoying. I've found out that Google Instant Search would not do that! So i switched the instant search back on and it's fine again. Don't get me going on Instant Search. ;) I personally find it to be a completely unnecessary, bandwidth-wasting distraction. BUT that may just be because of how and what I search. If you like it then that's great but it drives me crazy if I don't disable it. The matter is that i hate the single results problem much more than instant search disadvantages (e. g. 10 results per page). 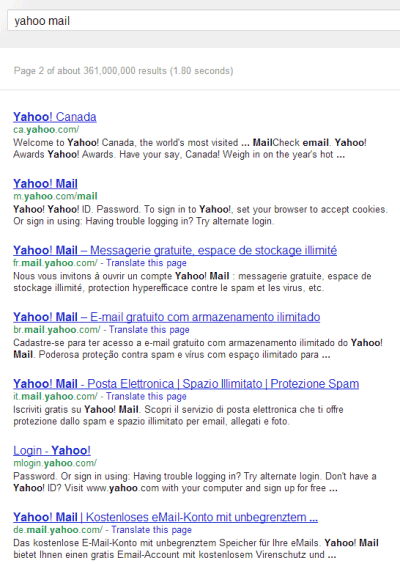 I search from Opera address bar, so i only see instant search in action when i modify the search string. Agreed, a very annoying "feature", and one often complained about in Google's Web Search product forum. This popped up on reddit a while back and someone mentioned that if you limit your search results to 10 results per page, you get way less results from the same site. Try it out. Maybe this is Google's way of trying to force us back to the 10/page setting, which allows them to show us more ads. It's true, but all the examples from this post except one ([sony led]) use the default settings and 10 results per page. If you switch to 50 results per page, Google shows even more results from a domain and expands the number of queries. I sent a feedback to Google about this, hoping they can deal with it soon. I have just done a search for (success quotes) and the first 55 results are the same website. This sort of host-crowding is driving people away from Google. The stats for my website inbound search have shown a steady increase from other engines over the past few weeks. This indicates that Google is losing market share. Google is driving me to explore other search engines because of this "feature" - I can often tell if a domain doesn't contain the type of information I'm looking for. Now I have to scroll through a whole slew of results from the same domain before finding a different source! Part of the point of searching is finding different sources. Thanks for sharing such informative post on web hosting. Keep updating. Snap on keywords to know more.